Colonel “Gratz” Brown was in command of Union forces at Ironton in August, 1861, when he was relieved by newly commissioned Brig. General Ulysses Grant. 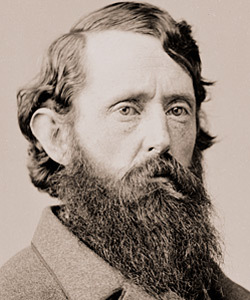 Grant noted in his Memoirs that Brown “was gladder to see me on that occasion than he ever has since,” a reference, tongue-in-cheek, to the fact that eleven years after their Ironton meeting Brown was Horace Greeley’s running mate on the Radical Republican ticket which challenged Grant’s run for a second term as President. Before the Civil War, Brown had the distinction of having fought the last duel on Missouri soil, against a man who would ultimately be Missouri’s Confederate Governor-in-exile, Thomas Reynolds. Brown’s Civil War service for the Union was largely undistiguished, although he rose to the rank of Brig. General of Volunteers. Brown died a resident of Kirkwood, Missouri, and is buried in Kirkwood’s OakHillCemetery.